Start shopping and make your pet happy! Pet supplies at their very best for you! 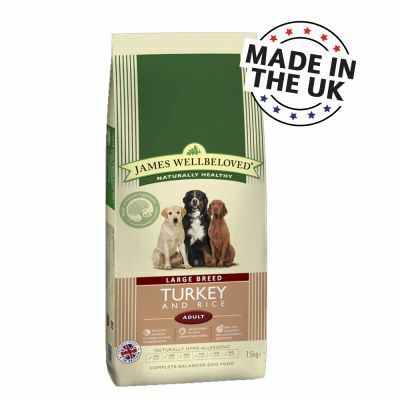 James Wellbeloved Large Breed Turkey & Rice is specifically designed for large breed dogs. A natural hypoallergenic dog food that avoids use of ingredients that cause food intolerance. Excellent for Golden Retriever :"My Golden has been in been on this (and previously junior) for several months. Its the only food that actually seems to fill him up, he loves it and his coat and health is fantastic. He has a sensativ"
Delivery in 1-3 working days ...more All prices include tax., Additional shipping costs may apply. No further discounts can be applied to this variant. 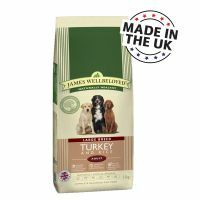 The James Wellbeloved Turkey & Rice is a rich source of Turkey and carbohydrates of rice and barley, that is gentle on your dogs digestion. It is especially designed to support the continued growth and development of large breed dogs to keep them healthy and active. James Wellbeloved avoids adding artificial colours, flavours or preservatives. All James Wellbeloved pet foods are hypo-allergenic and use a single source of animal protein to help your pet avoid the misery of food intolerance. Turkey offers white meat goodness, gentle on the stomach and easily digestible. Brown and Pearl Rice are highly digestible carbohydrate sources that are gentle on the stomach. Barley Is a natural source of carbohydrate, providing an excellent source of dietary fibre. Natural Seaweed is rich in iodine and rare trace elements. Also contains natural gums which can help aid the digestive process. Alfalfa is a rich source of natural beta-carotene antioxidant, and provides essential trace minerals and dietary fibre. Sugar Beet is a natural provider of dietary fibre, beneficial for intestinal health. Yucca Extract is a natural deodoriser. Makes scooping the poop friendlier. Linseed is rich in omega fatty acids and helps to promote a soft and glossy coat. James Wellbeloved avoids using many of the ingredients renowned for causing food intolerances. 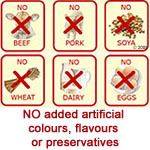 This means James Wellbeloved cat and dog food and treats do not contain beef, pork, wheat or wheat gluten, dairy products, eggs or soya. Ingredients: Rice, turkey meal, oats, turkey fat, whole linseed, turkey gravy, pea protein, sugar beet pulp, alfalfa meal, natural seaweed, omega oil supplement, potassium chloride, parsley, nettle, chicory extract, sodium chloride, calcium carbonate, glucosamine, chondroitin, yucca extract. Minimum levels: Turkey (26%), rice (26%), oats (10%), linseed (4%), turkey gravy (2%), alfalfa (1%), seaweed (0.5%), yucca extract (0.02%), chicory extract (0.1%), glucosamine (0.0275%), chondroitin (0.0225%), parsley (0.1%), nettle (0.1%)). Additives per kg: Antioxidants: E306/Natural antioxidant, 150mg, Vitamins: E672/Vitamin A, 15.000 iu, E671/Vitamin D3, 2,250 iu, Trace elements: E1/iron, 40mg, E2/iodine, 2mg, E4/copper, 5mg, E5/manganese, 25mg, E6/zinc, 100mg, E8/selenium, 0.2mg. Always provide your pet with fresh water both during and between meals. My Golden has been in been on this (and previously junior) for several months. Its the only food that actually seems to fill him up, he loves it and his coat and health is fantastic. He has a sensative tummy but this food is perfect for him. CONTINUES TO BE THE PERFECT PRODUCT FOR OUR PET WHO HAS MULTI ALLERGIC REACTIONS. I feed JW for a long time but this is the first time that my GSD had an upset tummy from it. Thought it was a good idea to give him a break from the fish and rice and gradually changed him to this one . Loads of rumbling and passing gas plus reflux! :( Will stick with the fish and rice. Guess its to rich for him. 3 large breeds look really well on this, good weight and glossy coats, plenty of energy and very content and happy dogs. Larger kibble really slows eating time down too. This is a great product. My dog loves it and she is always complimented on her shiny healthy coat. It is great value too! Excellent product! Max Loves It! Max, my gorgeous Labradoodle has many allergies and food intolerance and James Wellbeloved turkey and rice is the only dry food he can eat. At one stage last year is stools were extremely bloody and pure diarrhea. I was very worried about him and I tried everything. Now, with the James Wellbeloved ,and Arden Grange wet food, he is thriving, is a different dog and is very happy. If your dog suffers from allergies and food intolerance please try them on this food. Max is thriving. Sam my Doberman loves this food, his coat is perfect, he is not sensitive to other food and has treats too, liver fish ect Also you can't beat the price. This is more or less organic quality dog food. My dog loves this food but it's satisfying due to the rice so it doesn't eat it all up and then beg for more. Instead she seems really satisfied and chilled out after her meal. And it's nice to have food specifically aimed at bigger dogs. One size doesn't fit all. 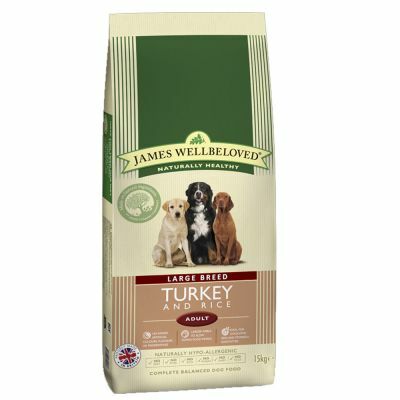 This is a really good dog food, like a lot of the other flavours in the James Wellbeloved range. I'm thinking of switching to this brand for my cat's food too. The seaweed does seem to add something a little more special given that turkey can be quite bland. Smells pretty good. I'd recommend to other owners with big dogs. James Wellbeloved large breed is definitely worth getting for your dog. Convenient ordering/delivery, dogs eat all their food and seem satisfied afterwards and they're really regular with their bowel movements (thank GOD!). It's honestly less hassle in the long run to buy better quality dog food. I would definitely recommend this. My greyhound loves this food. I'm planning on trying out a few other flavours with him too, now that we know it's as good a quality as claimed. Fingers crossed that all the other flavours from James Wellbeloved are as good. Food arrived quickly, well packaged, good product, fair price. Pleased with zooplus. You are what you eat! We love this food. My dog's health is as important as mine, and I know that his health is being looked after by James Wellbeloved. Just pure goodness in every meal, and it shows. All prices include tax., Additional shipping costs may apply. In 90% of cases, delivery takes place within the specified number of working days (excluding weekends and public holidays). This may vary depending on availability, payment method, location and other factors beyond our control. We’ll let you know when the product is back in stock again. We hope you enjoy the rest of your shopping at zooplus! Thank you for taking the time to review this product. Here at zooplus we check each review individually so your review will not appear immediately. We publish all reviews that are acceptable within our netiquette guidelines. Please see our Review Publication Policy for further information. Thank you for submitting your product photo! We carefully review each photo before it is published and will let you know if we cannot publish it for some reason. You can view and manage your product photos from myzooplus. Most photos are published within 3 working days. In order to comply with the Veterinary Medicine Regulations, please confirm the type of animal you will be giving this licensed product to.